The Department of Energy (DOE) announced a $32 million funding program to support jobs and research in the solar energy sector on Tuesday. 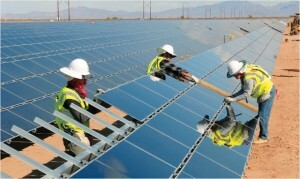 – Some $12 million will go toward projects to train solar technicians and provide information about solar power to “other professionals in related fields such as real estate, insurance, finance and fire and safety.” The funding will go toward the Obama administration’s goal of training 75,000 new solar workers by 2020. – The department will also spend $15 million on projects to develop new concentrating solar power (CSP) collectors, which are the most costly component of a solar power system. At least seven projects will split the funding and research ways to bring down those costs in the future. – The rest of the funding will go toward at least three projects to collect and share data on the solar industry, such as power production and financial information. The DOE said the approach will help increase “transparency and fair pricing” in the market. The funding comes from an Energy Department program called the SunShot Initiative, which is designed to boost solar power in the United States. The program has funded more than 350 projects in the last four years.